He’s Jean-François Flechet: smart, careful, decisive. And he’s the driving force behind one of Cincinnati’s best new restaurants: Taste of Belgium in Over-the-Rhine. So how did he create a cult-like following for his Belgian waffles? Seduce the city with his secret recipe? 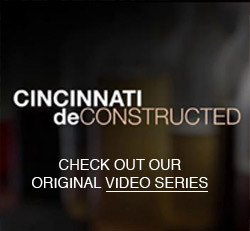 Find out here in the second episode of Cincinnati Deconstructed – filmed and edited by Michael Holder and written and produced by yours truly. If you like what you see, make sure to let us know by commenting, tweeting, pinning and/or posting on Facebook! This project is a labor of love and your feedback will go a long way in determining how many more we’re able to do in the future. So please share, friends! Thank you to Jean-François Flechet and his entire team at Taste of Belgium for accommodating us during this shoot – and for all that they’re doing to make Cincinnati a thriving, exciting place to eat. So the next weekend I did and here is Jean-Francois baking waffles and wondering who the dork was taking his picture. He’s come a long way since then, congrats Jean-Francois you’ve earned it!And thanks Courtney and everyone else for another fantastic video, these are incredible. Brilliant! The #lovefest continues. Great work everyone. Wonderful profile of one of the hardest working guys I know in Over-the-Rhine, Cincinnati! i’m really enjoying this well done video series. good job! Another great Cincinnati de-Constructed episode! In addition to the first-rate production values of these videos, I love hearing your talented subjects talk about the passions that drive them. You and Michael are doing something really unique and compelling with this series. Please continue. We have tons of food talent in this town! Five star production ! Really enjoyable ! hear, hear!!!! I second (and third!) every comment above. wow. wow. wow. Proud to know you two and share your work! To all, thanks for watching and supporting what we think is a very cool project. Please share with your friends! ok, having just watched that, i now want to try that place this second. it makes sense to do videos of the actual people/food that make up a place. food is way too sensory for only pen and paper! go courtney! Great job! The first time I had the waffles was at a Wild About Wine event at the zoo. My friends and I started to get embarrassed because we kept going back for samples.